All transactions are safe and secure with a reliable history in online purchasing behind each of our associates. Buy the Wildcats High School Musical t-shirt to own High School Musical clothing and merchandise. The front of this High School Musical t-shirt displays a Wildcats Athletic Department logo that is a physically fitting way to show that you love High School Musical. You no longer have to hide your admiration for the Disney Channel movie that teaches us that it's okay to share our inner voices with the world. Just follow the example of Troy and Gabriella, who come together through the power of music. Match it with HSM hats. 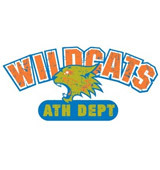 In addition to the Wildcats High School Musical tee above, browse the High School Musical Clothing Gallery for more apparel like men's and women's clothes, kids shirts or hoodies.